Need help? Ask us! Get individual, personalized research assistance from one of our professional librarians. No appointment is necessary. Takes minutes, saves you hours! For current SMC faculty, students and staff. Emails are reviewed during regularly scheduled reference hours. 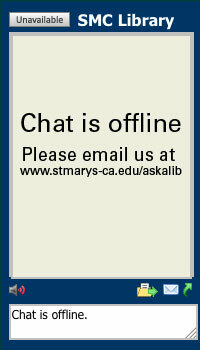 Email: askalib@stmarys-ca.edu. Cite your sources. Librarians are masters with citation styles! No question is too big or too small for the Reference Desk! Librarians are available during reference hours and by appointment.